As Thanksgiving approaches, the company has added texting to its marketing menu. Could the Pilgrims digest food safety tips on social media? PR and marketing pros at Butterball are going mobile this year. Market research indicated the popular Butterball Turkey Talk Line should boost its outreach to millennials. So, for the first time since its 1981 launch, the hotline is offering a texting option for those who need immediate help. Would the Pilgrims plotz if they saw Butterball’s 40 Pinterest boards? In a phone interview with Health Care Communication News, Janice Stahl, a supervisor at Butterball’s Turkey Talk Line in Naperville, Illinois, said texting services launched on Friday and are available through Nov. 24. 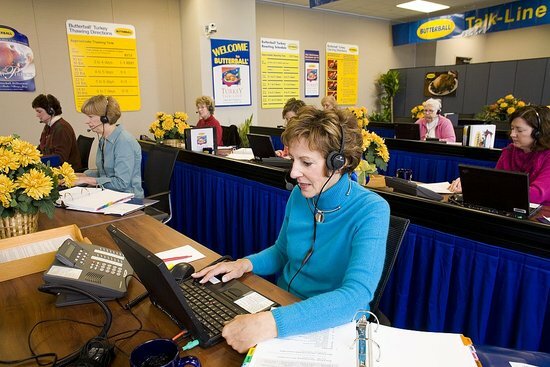 Butterball estimates that 10,000 people will call its help line on Thanksgiving Day. Who exactly is on the receiving end of the inquiries? Stahl says there are 50 “turkey experts” who have worked as dieticians, chefs and home economics teachers. “We are foodies at heart,” she says. Advice and reminders about food safety, hand washing and handling raw poultry are paramount, Stahl says. Though Smith is being modest in putting it this way, the fact is that Butterball’s help line is also shrewd marketing, positioning the brand as the turkey experts in the minds of many home cooks, even those who may have bought a Purdue or Bell & Evans turkey. According to a Butterball publicist, one thing the company hasn’t considered is a turkey chatbot, despite its steady adoption of digital platforms in recent years. “The equity in the Talk Line is that you get to speak to a real person who can help reduce stress and walk you through your questions,” the spokesperson said. Texting, which still involves a real person, is one thing, but home cooks apparently don’t want turkey advice dispensed by a robot. Smith’s phone crew—who all graduate from something called Butterball University—has evolved in other ways, too. In 2013, the staff added men after the company realized that “more men are cooking, and more men are calling,” Smith said. The woman who cleaned out her turkey with a scrub brush and asked if it was okay to do. A man looking for a quick way to cook his turkey who put it in the oven on the cleaning cycle. Is it okay to thaw my turkey in the bathtub while I bathe my kids? If I cut my turkey with a chainsaw will the oil affect the taste? Can I take my frozen turkey into my sauna to thaw it faster? Let’s just hope the conversation around the dinner table this year is palatable, too.